Daniel Green an accomplished Chef, Author and ShopHQ Personality who has written 10 cook books promoting healthy cooking joins eHealth Radio and the Nutrition Channel. His latest book, out now in the UK and available in the US in January is "The Paleo Diet: Food Your Body Is Designed To Eat". How did you get interested in cooking and what made you decide to cook only healthy food? 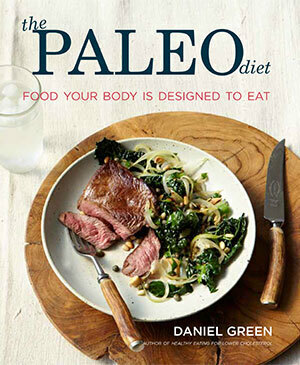 Your latest book is The Paleo Diet. Can you explain what exactly the Paleo Diet is and how is it different than eating a Raw Food Diet? In past generations, when kids were being picky eaters, they either ate the healthy meals that were served at the dinner table or they went without dinner. Now days if kids don't want to eat what is being served, parents will often take their kids out to fast food. More and more parents cater to their kids bad eating habits and often promote unhealthy eating behavior. What would you say to parents who do this? We are living in a country where a huge percentage of people are overweight and obese. Thinking about healthy meals…what can we do as a society including politicians, medical experts, teachers and parents to finally get this problem situation under control? Everyone is talking about getting healthy but if you look around, there are still so many overweight and obese people everywhere. What can we do? The American family is very busy today more than ever with PTA meetings, work, school, soccer, ballet and a host of other busy activities. Often times, healthy eating gets brushed to the side and junk food and fast food is served because of time and convenience. Can you suggest some easy and simple foods and recipes that busy parents can make to ensure that their family is eating healthy while on the go? Daniel Green is an internationally known Chef, Host, Television Personality and Award Winning Author. Also known as The Model Cook™, his fan base reaches England, Thailand, Malaysia, Singapore, Hong Kong, Dubai and the USA. This talented guy has been making appearances on talk shows around the world, planning meals for 2 major international airlines and developing in-room dining for a 5-star hotel chain in Asia. Based in the US, Daniel is a full time presenter for ShopHQ, one of the top luxury home shopping channels with a media penetration of more than 86 million homes where he quickly accumulated a long list of fans. As the resident Chef, the growing popularity of the kitchenware section led to the inauguration of a culinary program Daniel’s Kitchen dedicated to show casing Daniel’s healthy eating recipes while using the kitchenware sold on ShopHQ. Daniel has clocked over 9,000 hours of live hosting. Daniel has authored many cook books sold worldwide – Modern Dining for Life, Healthy Dining for Life, World Dining for Life, Healthy Eating for Lower Cholesterol (selling 1.4 million copies), Green’s Greens, Green’s Cuisine and The Best TV Celebrity Chef Cookbook. He is also the winner of the prestigious Gourmand World Cookbook Award. His next book, The Paleo Diet: Food Your Body is Designed to Eat is currently selling in the UK and will hit the US market in January of 2015. For the last 5 years, Daniel has created the in-room dining menus for the 18 properties that make up the 5-Star Dusit Thani hotel chain in Asia. He has also designed menus for the Shangri-La, Manderin Oriental, Hilton, Conrad, Sheraton, Westin, Marriott, Carcosa Seri Negari over the last 10 years. In 2013 Daniel Launched the Power Breakfasts at VIE hotel in Bangkok. Daniel also fronts 28 on-line videos for United Health Care explaining how to make nutritious, easy to make recipes. For the past 3 years, Daniel has been planning all of KLM's on-board meals totaling 2 million meals per year and Daniel just accepted BMI International Airline's offer to create their on-board meals. His simple, healthy eating recipes have been featured in numerous magazines in the UK, US and across Asia. In the UK, Daniel co-hosted a successful TV series for Discovery Health called Weight Matters with Vanessa Feltz. He filmed a series of travel documentary reports from Dubai, Thailand and around the world for Good Food Live on BBC’s UK Food Network. He makes regular appearances on BBC’s Saturday Kitchen, has hosted over 100 episodes of Kitchen Takeover Chef and hosted Weekend Kitchen in the US. 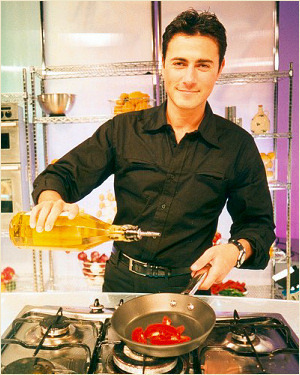 He was also the lead presenter and on-air Chef for QVC UK, one of the top five TV shopping channels in the World. Daniel has created his own range of healthy gourmet foods, ingredients and smart cooking tools. His products that include gluten free jams, spices and olive oil have launched in premium lifestyle stores in Asia, Australia and the U.S. under Daniel's personal brand, The Model Cook™.